Sometimes a question only relates to one team or project or shouldn't be visible to everyone, so we added questions to spaces so that you can lock them down using space permissions, and give each team ownership over their Q&A. 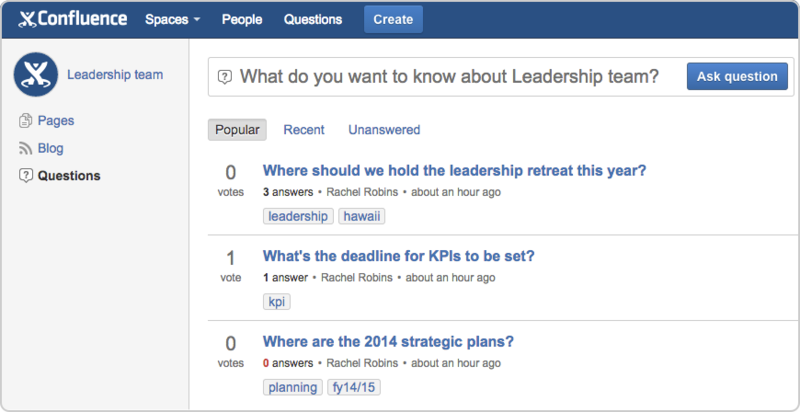 To ask in a space, choose Questions in the sidebar and ask away. Alternatively, you can go to Create > Ask a question and choose the right space from the drop down. When searching for questions, or browsing topics, we'll show you all questions, including any that have been asked in spaces that you have permissions to view. You can still broadcast your questions to everyone in your organization - go to Questions on the header to ask a question that anyone can see and answer. There are some events that are just too important to miss, and you wouldn't want anyone in your team to miss them either. You can now set reminders for each event type so that anyone who's added the calendar to their 'My Calendars' view will receive an email at your chosen time. From the reminder email you can click to view the event, or turn off reminders for the event type if you don't need them. You can't add reminders for JIRA event types just yet, but we hope to add this functionality in the near future.